Mike Krebs - mkrebs@shawmedia.com Gillian Young reacts to a poor drive on the first hole of the Boone Creek Golf Course in Bull Valley during the second round of the MCJGA Billy Vahldieck Tournament on July 11, 2013. 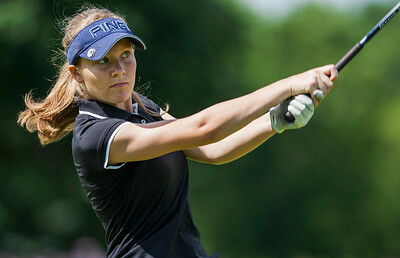 Young tied with Alexandria Siavelis for first place of the Senior Girls Division. Mike Krebs - mkrebs@shawmedia.com Alexandria Siavelis swings her driver on the first hole of the Boone Creek Golf Course in Bull Valley during the second round of the MCJGA Billy Vahldieck Tournament on July 11, 2013. Siavelis tied with Gillian Young for first place of the Senior Girls Division. Mike Krebs - mkrebs@shawmedia.com Alexandria Siavelis reads the green of the first hole of the Boone Creek Golf Course in Bull Valley during the second round of the MCJGA Billy Vahldieck Tournament on July 11, 2013. Siavelis tied with Gillian Young for first place of the Senior Girls Division. Mike Krebs - mkrebs@shawmedia.com Kaylee Ross swings her driver on the first hole of the Boone Creek Golf Course in Bull Valley during the second round of the MCJGA Billy Vahldieck Tournament on July 11, 2013. Mike Krebs - mkrebs@shawmedia.com Brad Spoeth swings an iron on the second hole of the Boone Creek Golf Course in Bull Valley during the second round of the MCJGA Billy Vahldieck Tournament on July 11, 2013. Spoeth tied with AJ Faneselow for first place in the first round of the tournament. 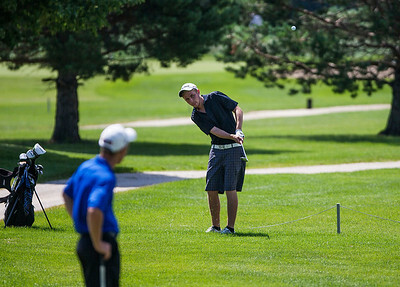 Mike Krebs - mkrebs@shawmedia.com AJ Faneslow watches his shot at the second hole of the Boone Creek Golf Course in Bull Valley at the during the second round of the MCJGA Billy Vahldieck Tournament on July 11, 2013. 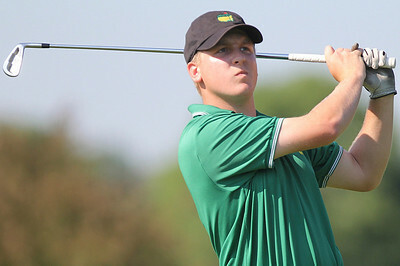 Fanselow tied for first place with Brad Spoeth in the first round of the tournament. Mike Krebs - mkrebs@shawmedia.com Tyler Ross reads a green on the first hole of the Boone Creek Golf Course in Bull Valley during the second round of the MCJGA Billy Vahldieck Tournament on July 11, 2013. Mike Krebs - mkrebs@shawmedia.com Brad Spoeth swings his driver on the first hole of the Boone Creek Golf Course in Bull Valley during the second round of the MCJGA Billy Vahldieck Tournament on July 11, 2013. Spoeth tied for first place of the Senior Boys Divison with AJ Fanselow in the first round of the tournament with a score of 76. Mike Krebs - mkrebs@shawmedia.com Tyler Ross swings swings his driver on the first hole of the Boone Creek Golf Course in Bull Valley during the second round of the MCJGA Billy Vahldieck Tournament on July 11, 2013. Ross tied for second place of the Senior Boys Divison with Nick Bonich in the first round of the tournament with a score of 79. Mike Krebs - mkrebs@shawmedia.com Nick Bonich swings his driver on the first hole of the Boone Creek Golf Course in Bull Valley during the second round of the MCJGA Billy Vahldieck Tournament on July 11, 2013. Bonich tied for first place in the first round of the tournament with a score of 79. 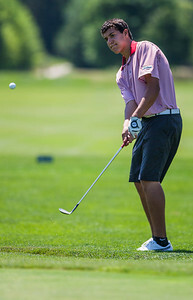 Mike Krebs - mkrebs@shawmedia.com Jake Bowser swings his driver at on the first hole of the Boone Creek Golf Course in Bull Valley during the second round of the MCJGA Billy Vahldieck Tournament on July 11, 2013. 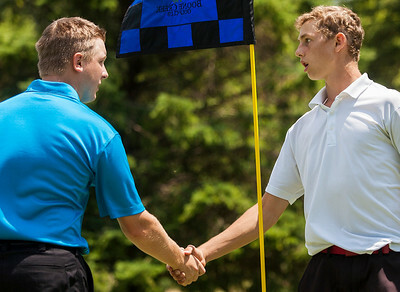 Kyle Grillot - kgrillot@shawmedia.com AJ Fanselow (left) shakes hands with Brad Spoeth after their last hole during the Billy Vahldieck McHenry County Junior Amateur at Boone Creek Golf Club Wednesday, July 10, 2013. Fenselow and Spoeth are currently tied for first place with a score of 76. Kyle Grillot - kgrillot@shawmedia.com Kaylee Ross tees off on the seventh hole during the Billy Vahldieck McHenry County Junior Amateur at Boone Creek Golf Club Wednesday, July 10, 2013. Ross is currently in second in her division with a score of 42. Kyle Grillot - kgrillot@shawmedia.com Gillian Young tees off on the seventh hole during the Billy Vahldieck McHenry County Junior Amateur at Boone Creek Golf Club Wednesday, July 10, 2013. 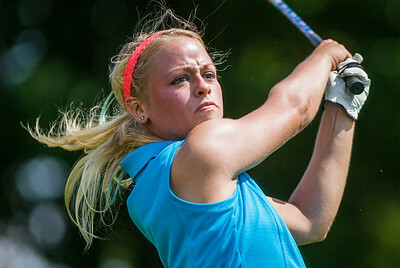 Young is currently tied for 1st in her division with a score of 41. 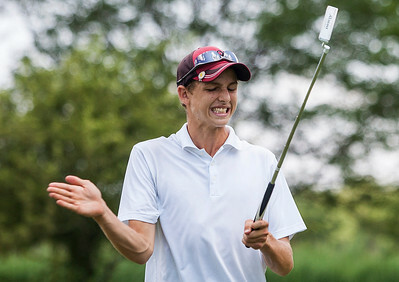 Kyle Grillot - kgrillot@shawmedia.com Brad Spoeth reacts after missing a put on his last hole during the Billy Vahldieck McHenry County Junior Amateur at Boone Creek Golf Club Wednesday, July 10, 2013. Spoeth is currently tied for first place with a score of 76. 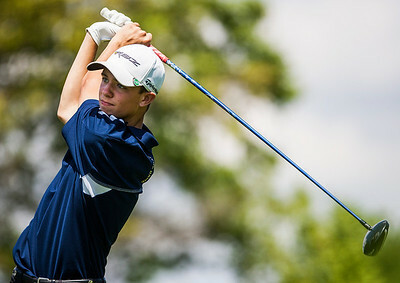 Kyle Grillot - kgrillot@shawmedia.com Riley Wicks chips his ball during the Billy Vahldieck McHenry County Junior Amateur at Boone Creek Golf Club Wednesday, July 10, 2013. Wicks is currently in fourth place with a score of 80. Kyle Grillot - kgrillot@shawmedia.com Tyler Ross tees off during the Billy Vahldieck McHenry County Junior Amateur at Boone Creek Golf Club Wednesday, July 10, 2013. Ross is currently in third place with a score of 79. Kyle Grillot - kgrillot@shawmedia.com AJ Fanselow tees off during the Billy Vahldieck McHenry County Junior Amateur at Boone Creek Golf Club Wednesday, July 10, 2013. Fenselow and Spoeth are currently tied for first place with a score of 76. Kyle Grillot - kgrillot@shawmedia.com TJ Wancket (left) watches as Jack Hawkins putts his ball during the Billy Vahldieck McHenry County Junior Amateur at Boone Creek Golf Club Wednesday, July 10, 2013. Kyle Grillot - kgrillot@shawmedia.com Kyle Murray reacts after missing a putt during the Billy Vahldieck McHenry County Junior Amateur at Boone Creek Golf Club Wednesday, July 10, 2013. Wicks is currently in fourth place with a score of 80. 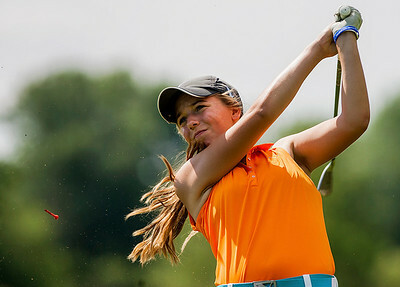 Kyle Grillot - kgrillot@shawmedia.com Brianna Digrazia tees off during the seventh hole of the Billy Vahldieck McHenry County Junior Amateur at Boone Creek Golf Club Wednesday, July 10, 2013. Kyle Grillot - kgrillot@shawmedia.com TJ Wancket (right) chips his ball during the Billy Vahldieck McHenry County Junior Amateur at Boone Creek Golf Club Wednesday, July 10, 2013. 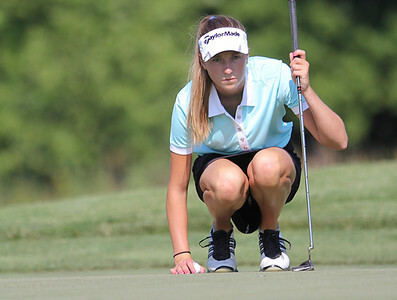 Kyle Grillot - kgrillot@shawmedia.com Emily Jean tees off during the seventh hole of the Billy Vahldieck McHenry County Junior Amateur at Boone Creek Golf Club Wednesday, July 10, 2013. 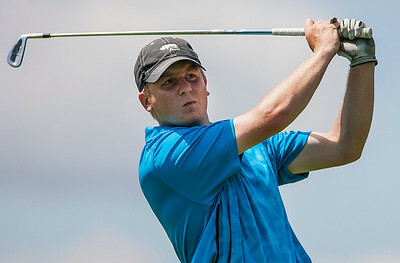 Kyle Grillot - kgrillot@shawmedia.com Bailey Bostler tees off during the Billy Vahldieck McHenry County Junior Amateur at Boone Creek Golf Club Wednesday, July 10, 2013. 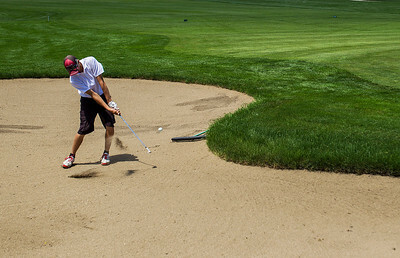 Kyle Grillot - kgrillot@shawmedia.com Brad Spoeth chips his ball out of a sand pit during the Billy Vahldieck McHenry County Junior Amateur at Boone Creek Golf Club Wednesday, July 10, 2013. 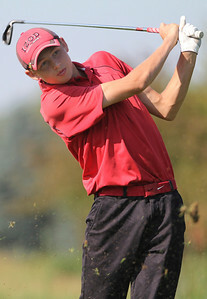 Spoeth is currently tied for first place with a score of 76. 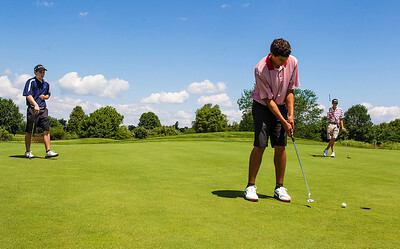 Kyle Grillot - kgrillot@shawmedia.com Riley Wicks (center) putts his ball while Daniel Swisher (left) and Kyle Murray watch during the Billy Vahldieck McHenry County Junior Amateur at Boone Creek Golf Club Wednesday, July 10, 2013. Wicks is currently in fourth place with a score of 80. 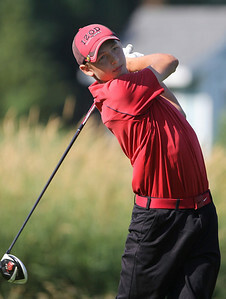 AJ Faneslow watches his shot at the second hole of the Boone Creek Golf Course in Bull Valley at the during the second round of the MCJGA Billy Vahldieck Tournament on July 11, 2013. Fanselow tied for first place with Brad Spoeth in the first round of the tournament.